Bursaspor is a Turkish football club located in the city of Bursa. They won their first Championship title in the season 2009-2010, which over half a century may look like a very disappointing tally, but with Istanbul's “Big Three” picking up almost every single domestic trophy it is nonetheless impressing. Bursaspor Kulübü (Club) were founded in 1963, following a massive merger, that saw Bursa's five major football teams, Acar İdman Yurdu, Akınspor, İstiklal, Pınarspor and Çelikspor, come together to form a single club. It took Bursaspor just eight years to win their first title, beating Fenerbahçe in the final of the Prime Minister's Cup, a competition less important than the Turkish Cup, but still a title for the Bursa side. In 1974, the “Green and Whites” got a first taste of international football. They lost the Turkish Cup final to Fenerbahçe, but the Istanbul team won the Championship as well, so Bursaspor were given the chance to represent Turkey in the Cup Winners' Cup. In times when beating just two teams was enough to send you to a UEFA competition's quarterfinals, Bursaspor eliminated Irish side Finn Harps and Scotland's Dundee United to reach the last eight, where Dynamo Kyiv proved too strong for them. Bursaspor won their first major title in 1986, beating Altay 2-0 in the Turkish Cup final, which took place in their own – old – stadium, in Bursa. A few months later, in the first round of the Cup Winners' Cup, Ajax left the Turkish side no chance to even dream of qualifying. Bursaspor's biggest success ever came in 2010, when they became only the fifth club to win the Championship in Turkey, and just the second outside Istanbul. Interestingly, it was the first club outside Istanbul that had won the Championship before (Trabzonspor, six times, in the seventies and eighties), that were meant to play a decisive role on Bursaspor's most glorious day. On May 16, 2010, Bursaspor were hosting Beşiktaş on the last day of the Turkish Süper Lig. At the same time, leaders Fenerbahçe were playing at home against Trabzonspor. Fener had 73 points, one more than Bursaspor, they were holding their fate in their hands, they knew that by beating Trabzonspor they would be champions, regardless of Bursaspor's result. The game in Bursa ended first, the home side beat Beşiktaş 2-1. The local fans couldn't celebrate though, not just yet, because the game in Istanbul was still going on. Trabzonspor were holding Fenerbahçe at an 1-1 draw, a result that didn't change until the final whistle, allowing, finally, Bursaspor's fans to experience something they had never lived before, see their team crowned champions. Justice was made, someone could argue, since Bursaspor had scored more goals than Fener, conceded less, had a better overall goal difference, and had even beaten them in Istanbul earlier in the season, in an... epic 2-3, in which the “Green and Whites” were 2-0 down half way the first half, but managed to earn a memorable win scoring twice in the last five minutes. 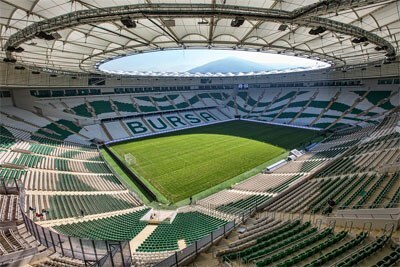 In 2015, it was time for the Bursa side to bid farewell to their historic Atatürk home, and move into their brand new Timsah Arena. “Timsah” is Turkish for “crocodile”, which is one of the team's two nicknames (“The Green Crocodiles”). No player has worn Bursaspor's jersey more times that defender Turhan Şen, and no one has scored more goals for them than Okan Yılmaz. The year they won the Championship though, it was Argentine Pablo Batalla and local guy Ozan İpek who were possibly more influential than the rest, leading Bursaspor in scoring, finishing the season with eight goals each. What's little known is that Turkish football icon Hakan Şükür spent two seasons at Bursaspor, from 1990 to 1992, and it was from them that Galatasaray signed him. Bursaspor's logo includes the name of the club, the founding year, a small Turkish flag, and interestingly, five stars in different colours. The team were founded in 1963 after the merger of five clubs that preexisted in the city, and the five stars are coloured exactly after the colours of those five clubs that came together to form one strong team in Bursa.